Front row (left to right): 1. Charles C_?, 2. Duilio Ridolfi, 3. Wayne Dickey, 4. Danny V_?, 5. John Ronda, 6. Billy Ginn, 7. Ronald Silcocks, 8. Steven C_?, 9. Joe Smith, 10. Billy Smith, 11. Norman Brazil. Second row: 1. Mrs Tracy, 2. Barbara G_?, 3. Lindy C_?, 4. Linda (Joy) Bodenhausen, 5. Judith Miller, 6. Diana McGregor, 7. Nancy V_?, 8. Helen L_?, 9. Phillis O_?, 10. Linda Morris, 11. Patti Arron, 12. Randy T_?. Third row: 1. David Cockey, 2. Bobby E_?, 3. Ronny F_?, 4. Eddie A_?, 5. Carolyn R_?, 6. Mary Adams, 7. Betsy P_?, 8. Willa Worley, 9. JoAnn B_?, 10. James F_?, 11. Tod E_?, 12. Austin Custodia. Credits: From the collection of Ron Silcocks. The kids in the picture are members of the high school graduation class of 1965. 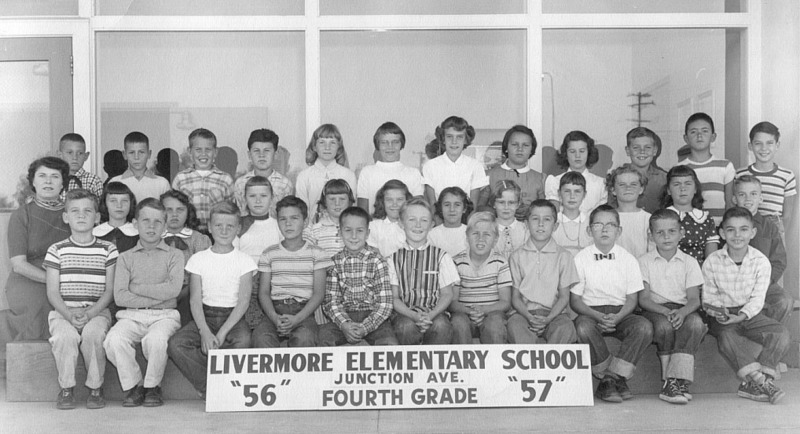 To find other pictures of the class of 1965 in the archive, see Livermore class pictures listed by year of high school graduation: 1965. And if you have any pictures of the class of 1965 that you would like to share, please submit them to the Archive.